American consumers love their baked goods, whether it’s to satisfy a sweet tooth with cookies, cupcakes, donuts, and other pastries or to satisfy a craving for something savory like a soft pretzel, bagel, or kolache. And, of course, the category also includes bread, biscuits, muffins, and more. Entrepreneurs who want to buy into a proven concept in this market have lots of choices to evaluate on this list of the 23 best baked goods franchises. Some distinguish themselves by focusing on a particular type or style of pastry, such as kolaches, French pastries, cinnamon rolls, and so on. One reason bakery chains are doing well is the increasing popularity of grabbing breakfast on the go, and most bakery franchises feature items that are traditionally thought of as breakfast foods. The bakery café market in the U.S. is worth $8 billion and has outperformed the rest of the food service sector in recent years. With six of these companies having achieved rankings on Entrepreneur magazine’s Franchise 500 list, here are the top 23 baked goods franchises of 2019. Auntie Anne’s makes eight signature fresh soft pretzels with eight dipping sauces, Pretzel Nuggets, pretzel dogs, and lemonade. The company also sells frozen pretzels that can be baked at home, as well as pretzel mix that can be used at home to get a fuller experience of making pretzels. Franchisees can choose from several store options, including in-line (malls, etc. ), kiosks, satellites (without on-site baking), and a food truck option. This company currently ranks #124 on Entrepreneur magazine’s Franchise 500 list. 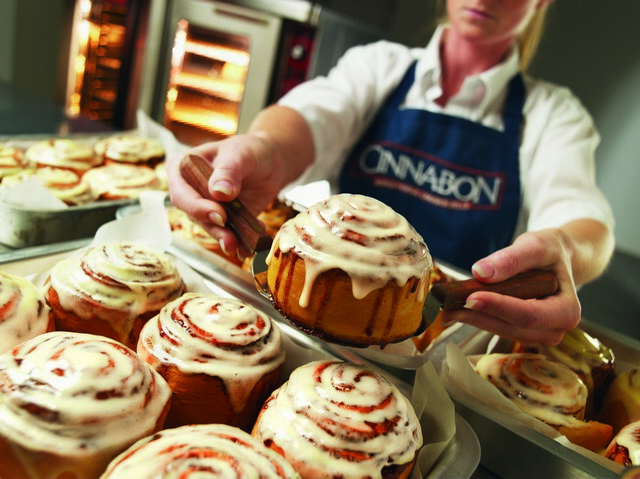 Founded 1988 and franchising since 1989, the number of locations has more than doubled over the past 10 years from 955 in 2008 to the current total of 1,947, of which 13 are company-owned and 646 are located outside the U.S.
Cinnabon puts a lot of work into developing the various features that go into its signature cinnamon roll. It gets its Makara Cinnamon from cassia trees in Indonesia, uses a dough whose recipe took months to develop, and tops the rolls off with a cream cheese frosting. In addition to several styles of cinnamon rolls, the bakery menu also includes CinnaSweeties (like donut holes) and Cinnabon Stix, along with a variety of coffee beverages. Popular locations include malls, travel venues, military bases, co-branded locations, and elsewhere. This company currently ranks #98 on Entrepreneur magazine’s Franchise 500 list. Founded in 1985 and franchising since 1986, the number of locations has more than doubled over the past 10 years from 743 in 2008 to the current total of 1,513, only one of which is company-owned and 615 of which are located outside the U.S.
Krispy Kreme Doughnuts has long been a popular brand of donuts in the Southeast. It has now spread throughout the U.S. and around the world. Known best for its signature glazed doughnut, it now has more than 3-dozen doughnut creations. Although there is plenty of room to expand its presence in the U.S., the company is heavily pushing international expansion. Einstein Bros. Bagels is one of the largest bagel chains in the country. Workers arrive at 2 a.m. in each location and bake fresh bagels every four hours. The menu presents 26 different kinds of bagels and 11 varieties of cream cheese, which it calls “shmear.” Also on the menu are 13 different breakfast sandwiches, 15 lunch sandwiches, 13 different desserts, and Darn Good Coffee. The chain is part of the Einstein Noah Restaurant Group, which includes other bagel brands such as Noah’s New York Bagels and Manhattan Bagel. In 2014, the company was acquired by JAB Holding Company and BDT Capital Partners. Founded in 1995 and franchising since 2006, the company website lists a grand total of 705 U.S. locations. Great American Cookies features a dozen different signature cookies, Double Doozies (icing between two cookies), 200 different hand-decorated cookie cakes for all occasions, and a trio of signature brownies. Everything is fresh-baked daily based on a generations-old family recipe. Most stores are located within shopping malls, but any high-traffic venue could become a non-traditional location. This company currently ranks #222 on Entrepreneur magazine’s Franchise 500 list. Founded in 1977 and franchising since 1978, the number of locations has been growing over the last 10 years from 286 in 2008 to the current total of 376, none of which are company-owned and 17 of which are located outside the U.S.
Wetzel’s Pretzels serves up fresh-made signature pretzels, cheese pretzels, Wetzel dogs, and Wetzel Bitz with five dipping sauces. Location options for franchisees include stadiums, airports, and tourist locations, but stores are primarily located in malls. Among its high-profile locations are Disneyland, Disney World, and Universal Studios Hollywood. This company currently ranks #268 on Entrepreneur magazine’s Franchise 500 list. Founded in 1994 and franchising since 1996, the number of locations has grown over the past 10 years from 243 in 2008 to the current total of 343, of which 20 are company-owned and 13 are located outside the U.S.
Shipley Do-Nuts is one of the few chains around that serves up fresh-baked donuts hot from the oven. In addition to its more than 60 varieties of donuts, it also offers kolaches (a Czechoslovakian filled pastry) stuffed with cheeses and/or meats. Franchisees receive a proprietary donut mix that requires only yeast and water to mix up into batter that is used for the donuts, kolaches, and other pastries such as cinnamon rolls, fritters, cakes, and a cream cheese roll. Founded in 1936 and franchising since 1987, the number of locations has hovered right around the 300-mark in recent years, with a current total of 298, of which 13 are company-owned and all of which are located in the U.S.
Pretzelmaker features fresh-baked soft pretzels, pretzel bites, pretzel dogs, eight different dipping sauces, frozen drinks, and six different lemonades. The pretzels are made from scratch and rolled daily in-store. Stores are designed to fit into smaller spaces, with an in-line option good for malls or shopping centers, a non-traditional option for other high-traffic venues, and a “Fresh Twist” option with expanded breakfast and late-night offerings such as pretzel flatbread pizzas and pepperoni pretzel rolls. Founded in 1991 and franchising since 1992, the company merged with Pretzel Time in 2010. In spite of that, the number of locations has been declining from a high of 363 in 2009 to the current total of 264, none of which are company-owned and 64 of which are located outside the U.S. Nothing Bundt Cakes started out as a couple of friends baking Bundt cakes for friends and family with only the freshest ingredients, but it quickly caught on as a viable business concept worthy of franchising. The key here is that the chain is filling a unique niche and offering a luxury product at affordable prices. Many are surprised this is a franchise because of the “mom and pop” feel with personalized service established at each location. On the menu are 8-inch Bundt cakes, 10-inch Bundt cakes, tiered Bundt cakes, miniature “Bundtlets,” Bundtlet towers, and bite-sized “Bundtins” in nine signature flavors, along with the occasional new flavor. Founded in 1997 by Dena Tripp and Debbie Shwetz and franchising since 2006, the number of locations has grown steadily from 15 in 2009 to the current total of “more than 260” as claimed on the company website. Bruegger’s Bagels founders Nord Brue and Mike Dressell spent two years working with a professional baker in New York City to perfect their bagel recipe and method, which includes first kettle-cooking the bagels and then baking them in a stone hearth oven. Complementing their 19 different bagels are a dozen unique blends of made-in-Vermont cream cheese. The overall menu is rounded out with 12 breakfast sandwiches, 12 lunch sandwiches, three fresh-made salads, seven signature soups, 14 desserts, and seven varieties of custom-roasted coffee. Founded in 1983 and franchising since 1993, the number of locations has declined slightly during the past ten years, from 280 in 2008 to the current total of 218 listed on the company website. Great Harvest presents itself as a franchise opportunity that can thrive in smaller towns that wouldn’t be considered worthy for a larger chain like Panera. Each location also has the option to largely create its own menu. The primary focus is serving up homemade whole grain breads with wheat kernels from family farms that are milled on-site to make fresh flour daily. The result is bread fresher than most options. The café menu features sandwiches using the fresh-made breads. Founded in 1976 and franchising since 1978, the number of locations has declined recently from a high of 212 in 2011 to the current total of 184, two of which are company-owned and one of which is located outside the U.S.
Philly Pretzel Factory bakes Philly-style fresh-made and hand-twisted soft pretzels, which means they’re shaped like a tall number 8 rather than the traditional soft pretzel shape, then baked in sheets and must then be pulled apart from each other. The menu includes a number of other options, including pretzel dogs, pretzel cheesesteaks, pretzel sausages, pepperoni pretzel melts, cinnamon pretzel twists, and Rivets (pretzel bites). Founded in 1998 and franchising since 2004, the number of locations has more than doubled over the past 10 years from 103 in 2008 to the current total of 174 (a slight decline from last year’s 183), seven of which are company-owned and all of which are located in the U.S.
Nestlé Toll House Cafe by Chip was born in 2000, although the Nestlé company itself, one of the largest food companies in the world, dates back to 1905 and has the distinct advantage of brand-name recognition. Café menu offerings include fresh-baked cookies, ice cream, cookie cakes, crepes, wraps, paninis, flatbreads, frozen yogurt, and real fruit smoothies. The number of locations has held steady in recent years at the current total of 155, only one of which is company-owned and 52 of which are located outside the U.S.
Gigi’s Cupcakes builds on the growing cupcake craze with a huge variety of cupcakes topped with its signature swirl of frosting and other toppings. In addition to cupcakes, the menu includes cheesecake and gluten-friendly options. Gourmet cupcakes have been a rapidly growing segment in the baked goods industry because demand is strong. Cupcakes are much more flexible and easier to handle and serve or take on-the-go than full cakes. Founded in 2007 and franchising since 2008, the chain received a big boost when it was featured on the television program Undercover Boss in 2015. The number of locations, however, has declined from 95 last year to the current total of 86, of which nine are company-owned and all of which are located in the U.S.
Ben’s Soft Pretzels makes Amish-inspired large pretzels, fresh-made from scratch and rolled by hand in-store with salt imported from Germany along with 11 gourmet dipping sauces. Further customization is possible with its Bake N’ Shake toppings. The menu also features Buggy Bites, Pretzel Stix, Pretzel Pockets, and several other signature pretzel creations. In addition to traditional locations, sites can be located within Walmart and Meijer stores as well as sports stadium venues. This company currently ranks #379 on Entrepreneur magazine’s Franchise 500 list. Founded in 2008 and franchising since 2013, the chain has grown rapidly over the last several years to 85 locations, of which 17 are company-owned and all of which are located in the U.S.
Big Apple Bagels/My Favorite Muffin has a primary focus on fresh-baked bagels, cake-like muffins, and gourmet coffee. All items are made fresh daily on-site with a menu that also includes breakfast sandwiches and deli sandwiches. The company is a collection of three branded product lines – Big Apple Bagels, My Favorite Muffin, and Brewster’s Coffee. Franchisees have the option of opening either a Big Apple Bagels (that also carries the muffins) or a standalone My Favorite Muffin, and both feature Brewster’s Coffee. A third option is SweetDuet that offers the My Favorite Muffins combined with frozen yogurt and Brewster’s Coffee. Founded in 1993 and franchising since then, the number of locations has declined over the last 10 years from 119 in 2008 to the current total of 80, none of which are company-owned and all of which are franchised in the U.S.
Kolache Factory occupies a unique niche in the bakery segment with its focus on a wide array of kolaches. A kolache is a slightly sweet fresh-baked pastry traditionally filled with sausage, cheese, or fruit that originated in Czechoslovakia centuries ago but has gained in popularity throughout the U.S. The highly portable snack is affordably priced and franchisees have options that include drive-thru service as well as shipping online orders of kolaches. The menu is rounded out with gourmet coffees and a variety of traditional pastries such as cinnamon rolls, croissants, strudel niks, and more. This company currently ranks #416 on Entrepreneur magazine’s Franchise 500 list. Founded in 1981 and franchising since 2000, there are currently 56 locations, of which 25 are company-owned and all of which are located in the U.S. Le Macaron French Pastries distinguishes itself in the bakery segment by offering authentic French pastries and is named after the country’s best-known signature pastry, the macaron (which is not the same thing as the popular coconut cookies called macaroons). The menu also includes gourmet chocolates, French gelato, classic French pastries, European style beverages, and homemade candies, with some locations also offering wine and sparkling wine. Baking does not take place on-site. Founded in 2009 and franchising since 2012, the number of locations has increased rapidly since then to the current total of 48, five of which are company-owned and all of which are located in the U.S.
Breadsmith presents a unique twist in the bakery segment with handcrafted, European-style artisan breads made by following the tradition of old world master bakers. Everything is made fresh from scratch without additives or preservatives and baked in a five-ton, European hearth stone oven. The menu also features a wide variety of other baked goods such as pastries, cookies, scones, sweet breads, coffee cakes, and more. Franchisees can fashion their own menus from the company’s more than 300 different recipes and enjoy revenue from both retailing and wholesaling opportunities. Founded in 1993 and franchising since 1994, there are currently 33 locations, two of which are company-owned and all of which are located in the U.S.
We’re Rolling Pretzel Company serves up hand-rolled pretzels using the company’s secret recipe for pretzel dough. In addition to traditional pretzels and pretzel sticks with nine different dipping sauce choices, the company also offers pretzel bites, pretzel dogs, and stuffed pretzels. Like many pretzel chains, units tend to be located in shopping malls, universities, transportation stations, amusement parks, and select big box retail locations. Founded in 1996 and franchising since 2000, the number of locations has declined over the past 10 years from 103 in 2008 to the last total reported to Entrepreneur magazine of 32, of which 15 were company-owned, but the chain’s website only lists 18 locations, mostly in Walmart stores. Cinnaholic is a bakery concept largely focused on gourmet cinnamon rolls. Starting with a fresh cinnamon roll straight from the oven, customers can then choose from over 30 different frosting flavors, and 30 different toppings to customize their treat. The cinnamon rolls are also 100% dairy-free, egg-free, cholesterol-free, and vegan-friendly. The chain’s appearance on the television program Shark Tank gave it a big boost, although the company declined the $200,000 investment offer from one of the sharks. Founded in 2010 and franchising since 2014, the number of locations currently stands at 23, only one of which is company-owned and two of which are located outside the U.S.
Rise Biscuits and Donuts is a relatively new company open from 7 a.m. to 2 p.m. daily, which means the focus here is on breakfast with its biscuits and donuts, while the lunch menu includes a variety of sandwiches on potato rolls, although the breakfast menu is available all day. Its signature buttermilk biscuits are the vehicle for a variety of breakfast sandwiches such as buttermilk-brined fried chicken, crispy bacon, salt-cured ham, and country sausage topped with egg, cheese, and spreads. Everything is baked fresh daily. Founded in 2012 and franchising since 2014, there are currently 16 locations listed on the company website. Between Rounds Bakery Sandwich Café is a bagel shop with two main streams of revenue that include the café operation supplemented with a focus on catering. If a location has adequate space, baking can be observed by customers. Besides fresh-baked bagels, the menu includes breads, other baked goods, sandwiches, wraps, salads, and soups. The doughs are prepared off-site and delivered to each store location for baking. Although a chain, stores are fashioned to have a local/independent feel to them. Founded in 1990 and franchising since 1992, there are currently four locations (a loss of one location from last year), three of which are company-owned.